You know my story from my blog, I think. I was given a 13% chance of having a recurrence, and told by four doctors that Das Big Boy’s prematurity was likely a fluke caused by a subchorionic hematoma. But I did p17 and weekly checks to be safe. The bummer was that I did wind up at risk for a second preemie thanks to cervical shortening. I didn’t have a cerclage because no one saw the reason for one, and I started shortening (immediately) after the 24 week cerclage deadline. The miracle was that I got my take-home baby, a 36 week and 3 day, 5 lb 13 ounce girl, lwho was handed to me the moment she was born. As I tell everyone, 36 weeks and 3 days is full term in my house. It’s a deeply personal decision, and a scary one. But there’s only one right answer, and that’s the one you guys choose. But I’d be lying if I said I enjoyed any moment of the pregnancy! I was nervous the entire time and never felt safe. I was always convinced something was going wrong and I didn’t know it. At one point, I actually saw a therapist (something I’d never done in my life) because I was lying awake in the middle of the night panicking about the idea of leaving Leo without a mother. And then after I passed Leo’s 29 weeks, I had a lot of guilt about making it farther this time. Doh! I was not pleasant to be around, that’s for sure. But in the end, it was worth it. We knew we desperately wanted two kids, and we were willing to take the risk. We didn’t want Leo to be alone when we’re gone. We have friends who used a surrogate to carry their own genetic child, and they had a great experience. We considered that for awhile, but the cost was too high to be realistic for us. We went for it and were lucky and now we are done and I never have to be pregnant again. Yay! I wish the best to you guys, whatever you decide! Thanks for sharing, Cori! (Tessa is gorgeous!) I can imagine the conflicting emotions that would come with making it farther in a second pregnancy. I fear I would be so, so guilty that I would not be able to enjoy a pregnancy at all. (Glad to know I wouldn’t be alone in that!) Ugh – this is such a scary/hard decision to make! It definitely helps to know other moms who have been there – thanks! Our preemies were twins, so we are done. 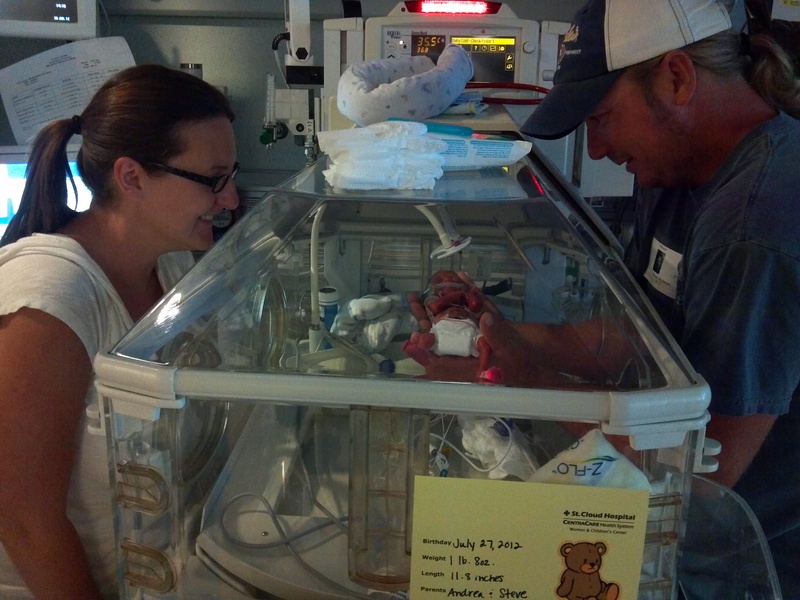 I couldn’t do NICU again, but its easy to say that when your family feels complete. I’ve always heard the whole “look around the dinner table and ask yourself if it feels like someone is missing” to help decide if you want more kids. If your family isn’t complete yet, you do whatever you have to do to make it complete. Good luck with your decision, even though I have already decided I catch myself wondering what if from time to time (seeing those darn other peoples newborns always gets me!!). They are great! I haven’t updated since I locked up the page, nothing really going on and they keep me so busy I wouldn’t have time to write if I did have something to talk about! E is talking up a storm and B is going to start speech therapy soon I think. I can’t wait to hear what’s on his mind (he talks a lot right now, just not super clearly). I had another baby after my preemie. Even though my preemie wasn’t as early (29.5 weeks) or as sick as yours, I will say, being pregnant post preemie was one of the most stressful things I have ever been through. I spent nine (note that number 😉 ) months *sure* something was going to go wrong (since I was pregnant after a preemie and 4 miscarriages). I even had panic attacks once I got to the point where I first developed problems with DD’s pregnancy. Despite being so *sure* that all would go wrong, to the point I refused to buy a car seat for new DS until the Saturday before his Monday scheduled c-section, it all went beautifully. He was 8+ pounds and born hungry (a preemie parent know whyI make note of that.). That’s why I *hate* it when people tell stressed moms-to-be to “think positive, it’s bad for the baby”. I thought positive with DD and got a 29.5 week IUGR preemie. I was negative with DS and got a 39 week baby that actually followed the “the rules”. It didn’t even affect the bonding – from day one he thought I hung the moon. Don’t worry when you worry. It might make whatever happens more stressful, but it won’t change the outcome. Good luck in whatever you decide. Paula – thank you so much for this comment! I often need “permission” to feel certain things and I really appreciate you telling me not to worry about being worried! Ha – I sound neurotic now. Congrats on both of your children! And I’m sorry for your losses. How old are your kids now? Thank you so much for sharing your thoughts. I am here any time to talk this through. We recently made a decision regarding our future family too. It’s not easy either way because there are a lot of heavy things to consider but I’m certain you will make the right decision for your family. Thanks, P! You are such a source of calm support for me – I’m so glad I met you! Hooray for social media, huh? I’m sure we will be talking more about this for sure. I’m curious how you and S worked through your decision. It feels so huge and overwhelming to us right now. I had two miscarriages before my son was born full term and had another miscarriage before my daughter was born prematurely (34 weeks). I had complete previa with my daughter it is where the placenta attaches to the lower part of the uterus and covers the cervix. It causes severe bleeding that can be life threatening. Therefore for the safety of me and the baby I actually ended up on hospital bedrest for 4 weeks prior to her birth. We were hoping to make it two more weeks as I had a C-section scheduled at 36 weeks. With that being said, I have a 2 year old and was admitted to the Hospital on December 16th (yes over Christmas). It was the hardest decision I ever made, but knew it was for the best. I know it would be different if your first child was the premie, but I think since my son was only 2, he really didn’t understand what was going on and he never will remember Mommy was gone for 4 weeks. We used Skype everyday I didn’t get to see him so that he could still hear my voice and it worked wonderful. My husband was a rockstar and my family was great support. We always wanted to have a larger family, 4 kids, but after everything we have gone through, I don’t know. I have a 25% chance of having complete previa again, and each and every pregnancy was filled with anxiety and worry. I felt like I was in denial each pregnancy until the baby was born and everything was okay. It is painful to think of having to be in the NICU again and I was only there for 3 weeks, unlike Jax. I am very happy we have two so they have each other to play with. But as the person early mentioned, children can come in different ways and adoption could always be an option. What ever you both decide, it will be okay, praying for you! Thank you for sharing your story! I’m so sorry for your losses. Previa is no joke – I’m glad you were in a safe place when your daughter was born. Thanks for sharing your tips on keeping connected while on bedrest – the thought of not being able to play with Jax or even see him makes me sad! 😦 Skype is amazing, isn’t it!? Oh Libby – your dear Zachary was looking out for his brother and sisters, for sure! I’m so sorry for your losses. You are such a source of inspiration for me – you always see the silver lining in everything! Thank you for sharing with me! Are you and the hubby thinking about another baby?!?! Awwww! 🙂 Any child would be lucky to be welcomed into your family. I hope your dream becomes a reality some day! That you for publishing this! You made me feel like there is hope for me to have a full term babies after I delivered my 1lb 13 ounce micro preemie!!!! Congratulations on your tiny warrior! How old is your baby now? Everyone’s story is different and there are so many causes for prematurity. I highly suggest a pre-conception consultation- it helped ease our fears so much. The doctor looked at all of my medical files and made recommendations specifically for me. Good luck and keep me posted, ok? I struggled with many of the same questions about a year and a half ago. I also have PCOS and very much understand how that complicates things. My early delivery was much more clear cut as cervical incompetence so I had a TAC (permanent abdominal cerclage) placed a year ago because the success rates are so high and chance of bedrest is rather low. The TTC journey has been more difficult this time around due to lots of scarring after V’s birth but we are hopeful that we can add a full term or nearly full term baby to our family sometime soon. Feel free to email me if you want to chat more about any of this! Thanks, Alyssa. The doctor did mention the TAC as an option for me, but without a clear indication of incompetent cervix, it might be a little too much too soon. I think it’s smart that you got it placed in preparation for a new addition to your family! I’ll be sending all kinds of positive thoughts your way! I have a feeling we will be talking quite a bit! I know this is a tough decision for you both, and no one can or should tell you what to do. so here is my rational for you both good and not good. 1. You both wish to expand your family. 2. You have more experience, and know the signs, Symptoms to watch for. 3. You will be closely monitored. 4. You have a great support system. 5. You make adorable babies. 6.You will never know if you do not try. And now for the negatives…1. You could have another preemie-micro or just preemie. 2. You could have a difficult time conceiving or mantaining a pregnancy. That is all I got for now. Ultimately it is a choice only you and Steve can make, and you will do whatever is best for you all, as a family! You have love and support either way from me! Thank you for the link, Heather! I can’t wait to read through her site – it’s exactly what I need now! Well…we were forced into being okay with it because we got pregnant naturally (which we were told was basically improbable)! I think we were getting close to being okay with trying again, though 🙂 I will be completely honest and say that the 2nd pregnancy was mentally exhausting and having a full-term baby is still awfully hard, especially when things went so bad the first time…you want even more for things to be ok and be “normal.” It’s a lot of pressure! Now that we are 9 weeks in…some things to think about is Jax’s needs…will you be able to meet all his extra needs. I feel guilty because I have barely any time (or energy) to work on Jack’s OT/PT/Speech homework and he is sick right now and I know that I waited to long to see his pulmo and his poor little lungs are paying for it! I feel awful! I guess what I’m saying is…try to think past the pregnancy and think about what it will be like to have 2 kiddos. I naively focused on just staying pregnant and surviving the pregnancy and am now a little shell-shocked by how hard this all is (because, of course, it’s supposed to be “easier” this time around, right?). Hang in there, mama! you’re doing great. Jack and Harper are lucky to have you! Next Next post: What Would I Tell My High School Self About Prematurity?